The sale of ivory products is booming in Bangkok, according to a new study. The number of items in shops in the Thai capital has nearly tripled in the past year-and-a-half. And the number of outlets - primarily targeting Chinese tourists - has steeply risen. According to the study conducted by the wildlife trade monitoring network TRAFFIC, the quantity exceeds the supply legally available under a 75-year-old Thai law allowing sales of tusks from domesticated Asian elephants. Because Thailand has no ivory registration system in place, it is not possible to trace the lucrative product. And that, according to the TRAFFIC monitoring networks, allows a loophole for laundering illegal ivory from African elephants into the Thai marketplace. Previous Thai civilian governments have pledged to end the country’s domestic ivory trade but it’s unclear how those pledges will be honored following the May 22 military coup. In the meantime, Doak says the illegal trade continues. Royal Thai Police deputy spokesman, Col. Krisana Pattanachareon, says Thai authorities will eventually make good on their pledge. “I’m a bit optimistic because if we really get on to it, although it will take a long time to solve the problem, but surely we will get there one day,” he said. The police colonel says Thailand is caught in the middle of a lucrative illicit global trade. TRAFFIC’s Doak is calling on Thai authorities to acknowledge their nation’s ivory trade is now out of control and fueling the African Elephant poaching crisis. “We want them to do what they’ve been saying they’ll do for at least ten years now, which is to close or to adjust and change the current legislations that would make the sale of African ivory in Thailand illegal,” she said. 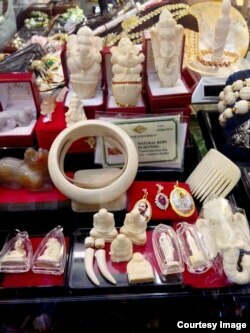 The new data asserting a significant increase in ivory objects on sale in Bangkok means Thailand is certain to face increased scrutiny at next week’s meeting of the Convention on Trade in Endangered Species of Wild Fauna and Flora (CITES) in Geneva. Environmentalists say 20,000 of the remaining 500,000 African elephants were killed last year, primarily poached for their ivory to meet the Asian demand. Thailand is an ideal spot for marketing to buyers. More than 25 million people visit the country annually. And the number of Chinese tourists is rapidly escalating. Last year 4.7 million Chinese took trips to Thailand, a jump of nearly 70 percent from 2012. Elephant tusks and teeth are carved into a variety of objects and shapes from ivory that sells for up to $2,000 a kilogram on the black market. The trade in ivory goes back to ancient history. But prices have soared 50-fold in the last decade as legitimate sources grew scarcer. Ivory was once made into numerous practical products, such as buttons, combs, hairpins and utensils and in modern times, such items as billiard balls and piano keys. China is estimated to be the destination for as much as 70 percent of the illegal ivory market. For many modern middle class and upper class Chinese, ivory objects are believed to bring good luck or are a way to display status. Most at risk to fuel this growing demand are the African elephants. Their Asian cousins are smaller and none of the females and only some of the males have tusks. Most of the remaining 30,000 Asian elephants taken from the wild are not killed but put to work or end up at zoos or as tourist attractions. Their trimmed tusks are the source of the legitimate domestic ivory. Elephants are revered in Thailand as a component of national identity, beliefs and culture. Those trying to preserve the pachyderms are hoping those deep emotional ties among the Thai population will help spur greater efforts here to save the largest land mammal.